October 16, 2013 /2 Comments/in Shoe Odor /by Jenn F.
Body odor is a natural part of growing up. Between the ages of 12-17, young people go through puberty and pheromones begin to surge. The apocrine glands produce sweat with a high level of protein that mingles with bacteria on the body and gets broken down into acids, causing an unpleasant odor. Thankfully, there are plenty of ways to treat common body odor and smelly feet. 1. Dry Out Smelly Feet! Feet trapped in shoes and socks all day long tend to sweat more and encourage the proliferation of bacteria and fungi, which love dark, warm, moist environments. Try wearing moisture-wicking socks and breathable shoes made of natural materials like leather. When possible, wear sandals or open-toe shoes to let the feet breathe. Sweat itself has no odor. The stench occurs during bacterial digestion. Therefore, limiting the bacteria on the body will also limit the smell. Use anti-bacterial soap at least once a day. On hot or active days, consider showering twice. Remember that the shoe is often overlooked as a source of bacteria. Why put a clean foot into a filthy shoe? Use a SteriShoe UV Shoe Sanitizer to kill up to 99.9% of the microbes in your shoes in just one 45-minute cycle. 3. Choose The Right Deodorant Or Antiperspirant! There are many different deodorant/antiperspirants on the market. Deodorants make the skin more acidic to discourage bacterial breeding, while antiperspirant blocks the amount you sweat. You’ll want to avoid cheap brands like Secret (Scent Expressions/Spray Deodorant), Suave, and Tom’s, which are notoriously bad. Instead, try Mitchum Smart Solid, Secret Clinical Strength, or Pristine Beauty Natural Deodorant. Dove Men’s Care, So Fresh So Dry, Degree Clinical Protection, Arrid, and Axe are highly-rated products on Amazon. Remember, every body is different, so it could take a few tries to find a product that keeps you dry. If smelly feet are a problem, check out special foot deodorant. Remove dead skin with a pumice stone, so bacteria doesn’t have a place to hide. Use lightly-scented moisturizer to keep the feet smooth. Look out for red scaly rashes (athlete’s foot) or yellowed nails (toenail fungus). Treat foot fungus with anti-fungal cream or spray — and oral medication, if necessary. If you have suffered with body odor for far too long, a pampering day at the spa may be in order. You might find a few wonderful-smelling products to add to your body care regimen through the guidance of a beauty expert. Certain foods are believed to increase body odor. The Huffington Post recommends par-boiling sulfur-containing cabbage, broccoli, and cauliflower with a pinch of sea salt before eating to remove odor-producing chemicals. Difficult-to-digest red meat produces enzyme residue that mixes with bacteria to intensify odor. Fish like tuna and salmon can cause people to secrete choline for up to a day after eating. Refined sugar in junk food can alter the make-up of perspiration. Lastly, low-carb diets can cause the body to emit a fruity, nail polish-type scent. If body and foot odor have been a problem for you, try these simple steps to break free! You’ll be smelling sweet in no time at all. Are Home Diabetic Foot Ulcer Sensors The Way Of The Future? Just to add to the list in Point 3 – Lavilin is an excellent product. The foot deodorant isn’t cheap, but well worth it. I apply it to the balls of my feet once a week and it eliminates the odor, regardless of how active I am that week. Highly recommended. Thanks for sharing! 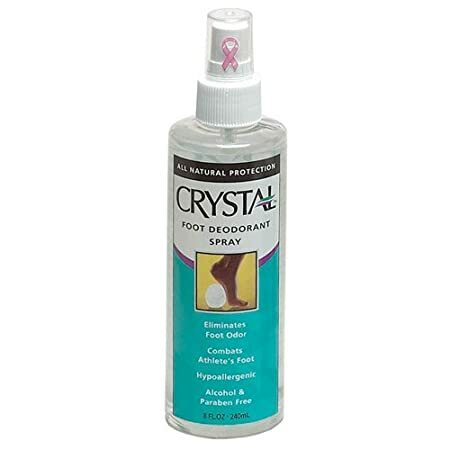 The foot deodorant sounds like a great way to limit the amount of foot sweat produced. When combined with SteriShoe’s ability to kill bacteria and fungus, one should have good smelling feet in no time! Preventing Diabetic Foot Ulcers: 10 Best Shoes For Diabetics Will Hydrogen Peroxide Kill Foot Fungus?